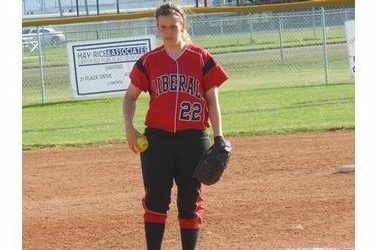 The Liberal softball team has surpassed last year’s win total with a sweep over the Stanton County Trojans 7-6 and 14-13 at the Liberal Softball Complex Thursday evening. After a 6-15 season in 2011 and a 3-18 season in 2010, LHS is 7-9. Ramey Petty led Liberal with two pitching wins and a 6-7 five RBI performance at the plate. In game one, LHS scored two in the first, one in the second, two in the third, one in the fourth, and one in the sixth. The Trojans scored two in the first, three in the fourth, and one in the fifth. Petty was 2-3 with two RBI’s and Micah Hasik was 2-3. In game two, LHS poured in seven first inning runs followed by one in the second, two in the third, and four in the fifth. Stanton County scored three in the first, four in the second, four in the fifth, and two in the seventh. Petty pitched five innings for the win and Jayce Darroch pitched two scoreless for the save. Petty was 4-4 with three RBI’s while Riley Hays was 3-5, Cynthia Cisneros was 2-5 with an inside the park homer, and Emily Bayouth was 2-4 with two RBI’s. Stanton County had eight errors in game two and LHS had four. LHS plays at Hays Tuesday.